The base engine that is featured with the 1500 is the 3.6L Pentastar V6 engine with eTorque. This engine can reach 305 horsepower, which is best-in-class V6 horsepower, and 269 lb.-ft. of torque. For those who want additional power under the hood of the 1500, the available 5.7L HEMI V8 engine can reach 395 horsepower and 410 lb.-ft. of torque and can tow 11,610 pounds. If you choose the 5.7L HEMI V8 engine with eTorque, you get best-in-class towing capability of 12,750 pounds. 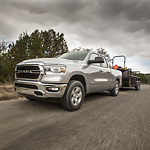 The Ram 1500 also offers the available class-exclusive Active-Level Four Corner Air Suspension System. When the truck is moving at highway speeds, this suspension system will automatically lower to provide you with enhanced efficiency and reduced drag.